Habitat: Monitors are typically from warm, tropic climates, such as Sampetra. They absolutely loathe the cold and wet. Typical Personality: Monitors, as stated above, hate cold and wet. They are slow and sluggish in the cold, but dangerous fighters when warm. Most tend to use tridents. Habits: The lizards speak with a hissing accent, their tongues often flicking in and out as they speak. Appearance: Monitor lizards can be as long as 1.5 feet and weigh between one and seventy kilograms. They have wide, short heads and tails. 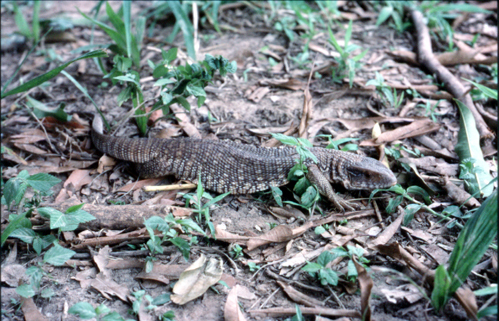 They have gray-brown scales, with rows of dark yellow spots across their backs. Diet: Monitors mostly eat snails, carrion, millipedes, small mammals, birds, snakes, toads, lizards, and eggs. Habitat: While monitors prefer the savannah, they will also live in rocky dessert type areas, open forests and woodlands. Typical Personality: Monitors are aggressively territorial. When cornered, they will hiss and lash their tail, getting ready to strike. Sometimes, if necessary, they will play dead. Habits: Lizards can flick their tongues 160 times every two minutes, but usually only do so 40 - 60 times per every other minute except after biting prey. They are also diurnal. Life Cycle: The female digs a nest and lays 20 - 50 eggs. The eggs hatch out after five to six months, in March.